This is the first in a three-part series looking at the Forest Gate area just over a century ago, through the eyes of social researchers, Howard and Wilson, who set out to describe conditions in an outer London area, in their highly-acclaimed West Ham - a study in industrial problems. The book looks at the whole of the borough and painted pen portraits of each of the local authority's electoral wards, in 1907. Below is their description of Forest Gate Ward (see map for the extent of the boundaries). Their portraits of Park and Upton wards will be posted over future weeks. In 1901, Forest Gate Ward had a population of 21,000 - the time of the census just before the authors conducted their survey. The ward lies to the north of the Great Eastern Railway to Ilford. The eastern part is divided from the western by the Woodford Road, a main thoroughfare connecting the southern part of the borough with Wanstead Flats, which adjoin the northern boundary. The two parts are different in character. In the eastern the houses are larger, and many of them are owned by the occupiers, or let an annual or quarterly rent. 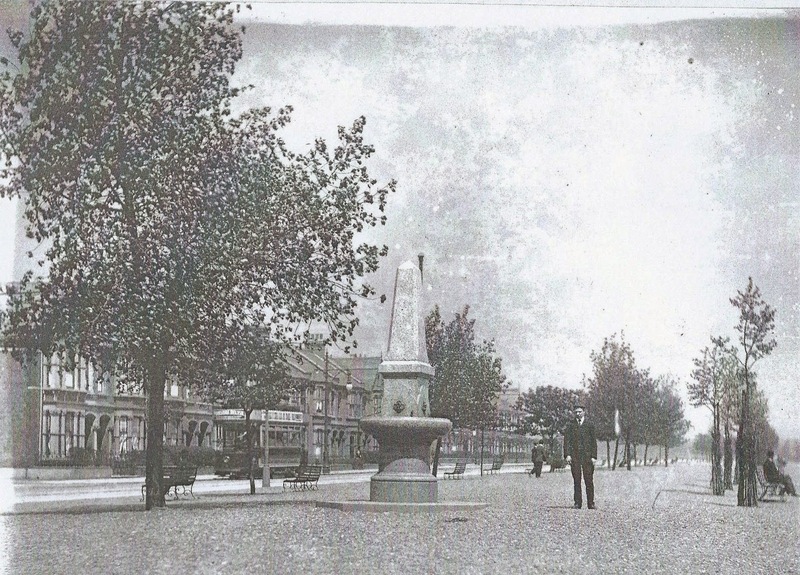 Chestnut Avenue and Avenue Road, which lead from Forest Gate Station to Wanstead Flats were built about 1875. The houses are detached or semi-detached, and are let by the year by the year or by the quarter at rentals varying from £28 to £50 per annum. The tenants are chiefly business people and clerks, whose work lies in the City. A change has overcome Avenue Road property during the last five years. The houses are difficult to let, and although the tenants are of the same class as formerly, they belong to a rather lower grade. On the other hand, some of the Chestnut Avenue property has largely increased in value. The reason of this is a demand in this district for houses with gardens. The lease of one of these with four rooms and a wash-house, was sold for £230, whereas it fetched £175 twelve years ago. In Godwin Road and its neighbourhood the homes contain five, six or eight rooms, and are inhabited by clerks, warehousemen, shop assistants, school teachers, and a few retired tradesmen. Some of the largest houses are the property of these last. 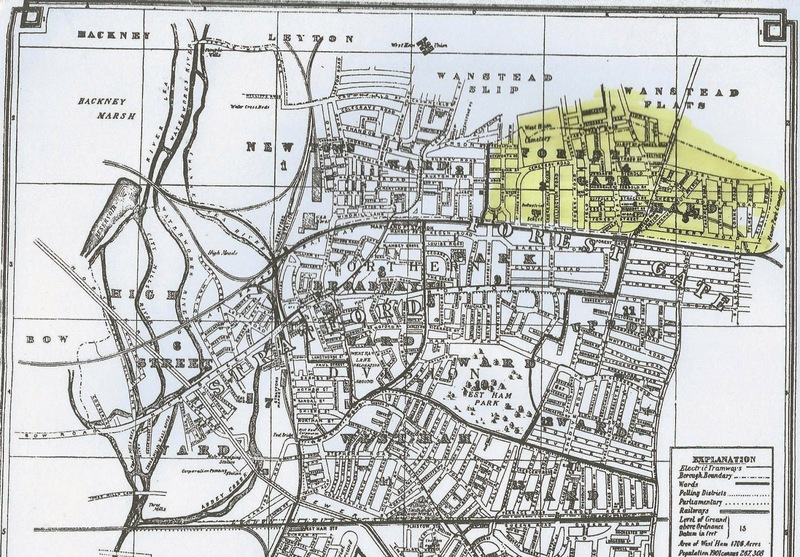 Land east of the Woodford Road was acquired by the British Land Company and sold to them by the Manor Park Cemetery Company, who developed this district, except the part between Woodford Road and Chestnut Avenue. A great part of the western section of the ward, that between the Woodford Road and Tower Hamlets Road, belonged to the Dames estate. In 1855, it was sold in plots of 75 to 80 feet by 100 to 110 feet, but was developed very slowly, a few houses being put up at a time. 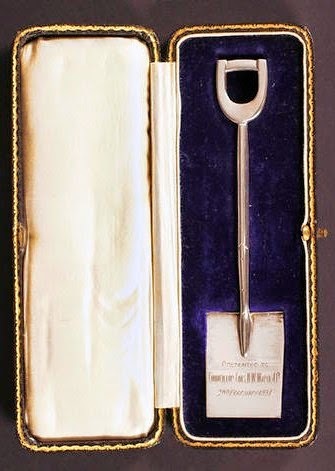 In about 1866 it was bought by a land company, and the development became more rapid. Londoners, such as Curtain Road (Shoreditch) cabinet makers and inhabitants of Whitechapel, often bought plots for gardens. They used to put up huts and spend the week-end in them, and many built houses at a later time. A large number of the plots were bought by the Conservative Land Society and United Land Company, who cut them up into smaller plots and resold them for sites. Building ceased about 1880. In Dames Road, which for the most part runs northward from Woodford Road, are some new flats, with separate front doors. 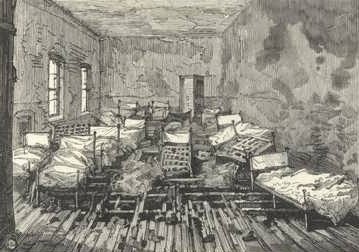 The accommodation consists of four rooms and a wash-house downstairs, and three rooms and a wash-house upstairs. They were built in 1903, and are inhabited mostly by newly married City clerks. These flats are very strictly kept, as they are in great demand. The rest of Dames Road, which was built in 1878, is chiefly inhabited by clerks and businessmen in the City, and has shops on one side of the southern end. The rents vary from 8s 6d, per week to £40 per year. The houses have maintained their level up to the present time, but the shops are difficult to let. 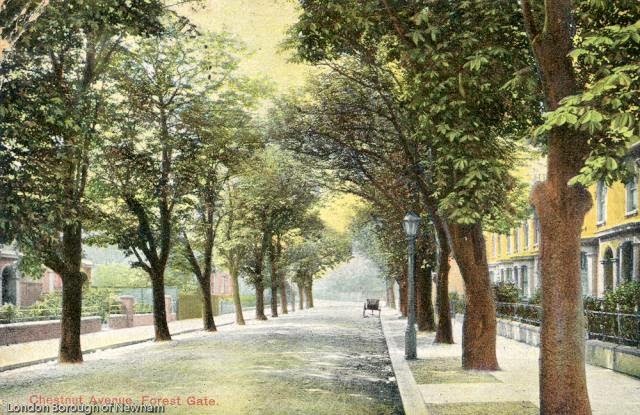 Vansittart Road, which is mainly inhabited by carmen (drivers of vans, or carts - at this time, usually horse drawn)and casual labourers, runs from Dames Road to the cemetery. It was built mainly about 1878, and consists of six-roomed houses, which are now let in halves, though originally meant for a single middle class family. The type is a common one in many parts of the borough. Downstairs there are two rooms with folding doors, a kitchen, and a wash-house; and upstairs, two rooms and a kitchen, supplied with a range and a sink. The rent of the lower flat is 6s 6d; and that of the upper 6s. In some of the shorter roads off Dames Road the houses are mostly four-roomed, and are let at 9s; but there are also some six-roomed houses at 11s, which are occupied by two families. The tenants are builders, joiners, stone masons and other artisans, with a few clerks. The Forest Gate and Tottenham Railway, which is raised above the ground level crosses all these roads. It was built in 1891, and is said to have caused a depreciation of property, 15s house rents having fallen to 11s. It has only been within the last eight or ten years that houses in this part of Forest Gate have been let to two families. From St James Road to the western boundary of the ward the houses are usually of a better class. They are occupied by men employed by the Great Eastern Railway Works (in Stratford, on what is now Westfield and the Olympic Park), and are the better paid artisans. Private speculators purchased land in this part, and estates in the neighbourhoods east of the Leytonstone Road were bought by the National Freehold Land Society. Forest Lane, which is the southern boundary of the ward, faces the Great Eastern Railway. It contains several large houses, but laterally some shops have been built at the Forest Gate end, because the present inhabitants of the district, less prosperous than their predecessors, demand shops within easy reach of their homes. Part of West Ham Cemetery and an Industrial School belonging to Poplar occupy a considerable space in the ward." The above description focuses mainly on male occupations, elsewhere in their book, however, Howarth and Wilson consider female employment, which would appear to have predominantly in the clothing industry. 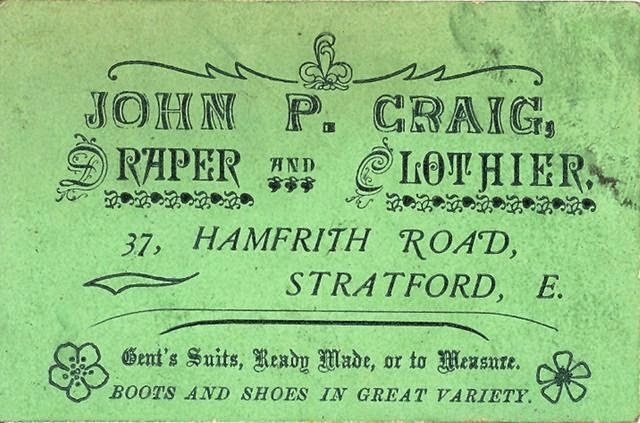 Many women work to meet some definite part of the family expenditure, such as children's clothes or boots and a considerable number of girls in Forest Gate and Upton Park make underclothing in order to pay for their dress. About 75 per cent of the workers employed in blouse-making live in the better parts of Plaistow, West Ham and Stratford, and in certain streets in Forest Gate and Upton Park where the rent is often 12s to 14s a week. 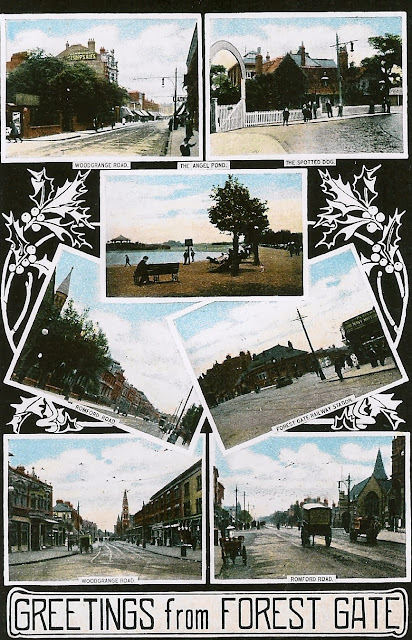 It is noticeable that those who live in Forest Gate and Upton Park, a considerable number live with their parents, while others have several brothers or sisters living with them, who are occupied in various ways, often as clerks. The majority were found in the better class streets in Stratford, Forest Gate and Upton. One or two rented their houses by the month; but on the other hand, one woman was living in a single room. The work is mostly of a good class, and is only entrusted to the superior type of home worker. All the workers in this group appeared to own their own machines. In some cases materials and models are sent by West End firms and the work is largely done by hand. The costumiers sometimes do private work, and are practically private dressmakers, who eke out their means by taking private work from shops. Newham Council's archives host a collection of original drawings, samples and commercial artwork of Charles Henry Ward, a local designer, printer - and later politician. 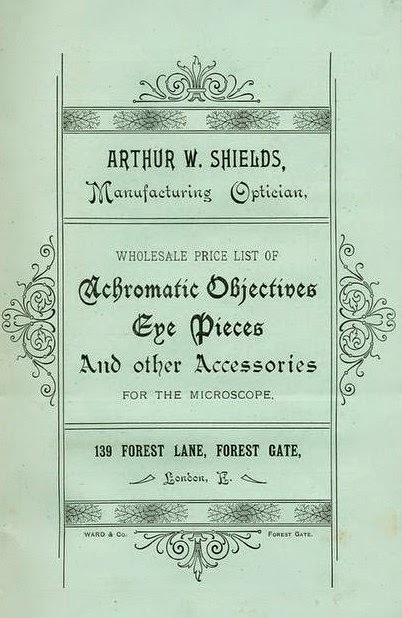 They constitute the samples book and folio of a fine Forest Gate art-nouveau craftsman. 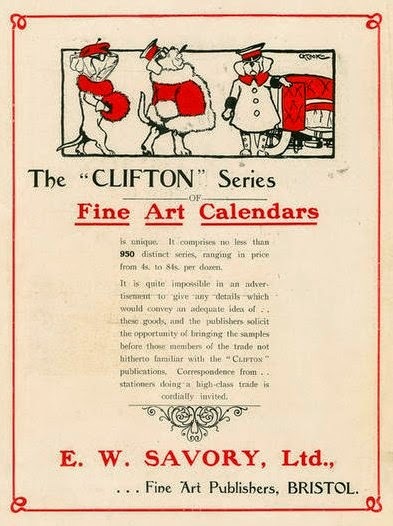 Some of his splendid work would have added considerable panache to the promotional material of many a local and national business, in an era when all artwork was hand crafted - before computer software made us all instant (and usually poor) designers. Charles was, additionally, a local politician of some significance, eventually becoming a Freeman of the Borough of West Ham. What follows is a brief account of his work and public service, pieced together from a number of sources. We would be delighted to hear from any of his descendants, with whom it would be great to share more information about him. 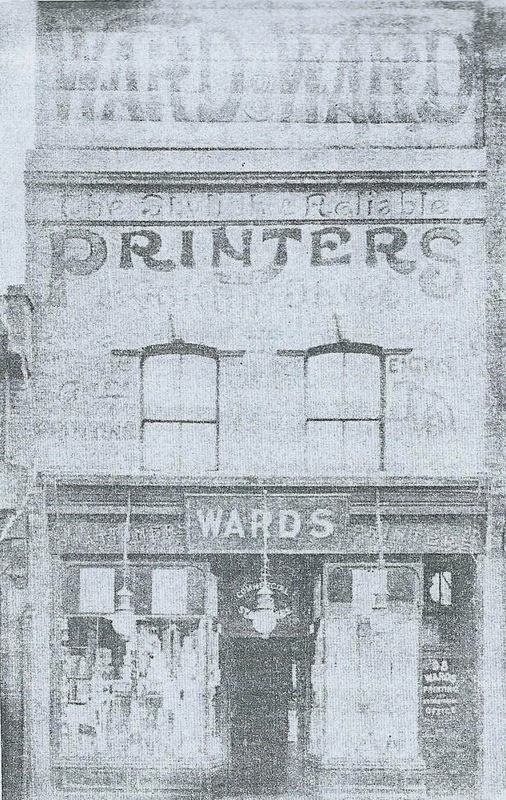 Charles was born in Walworth, South London in 1874, the son of Frederick, a print machine manager, whom he followed into "the print". He was indentured as a compositor's apprentice to T Scott, in South East London in the late 1880s. By the end of his apprenticeship - the quality of his work was being recognised by the professional press, for its "excellent workmanship". 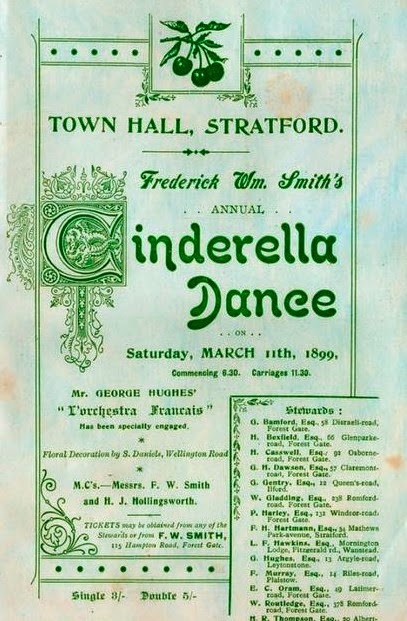 Ward later moved to Forest Gate, and by the time of the 1901 census was living in Thompson Road, West Ham, where he was described as an overseer print compositor. 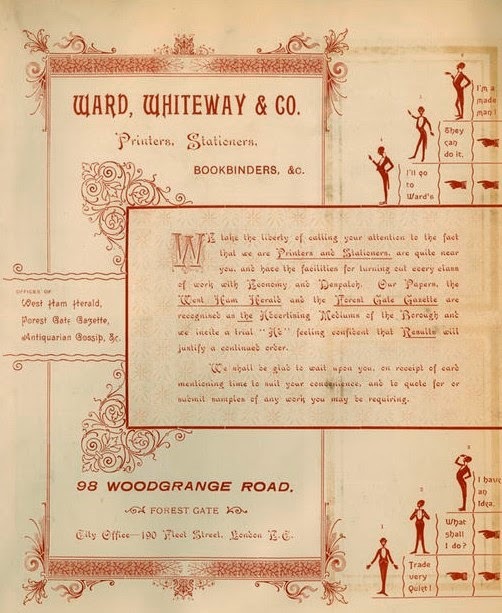 It would appear that he became a business partner of a Mr Whiteway and they established a printing company at 98 Woodgrange Road, which designed and produced work, of a high standard for local and national businesses and organisations. 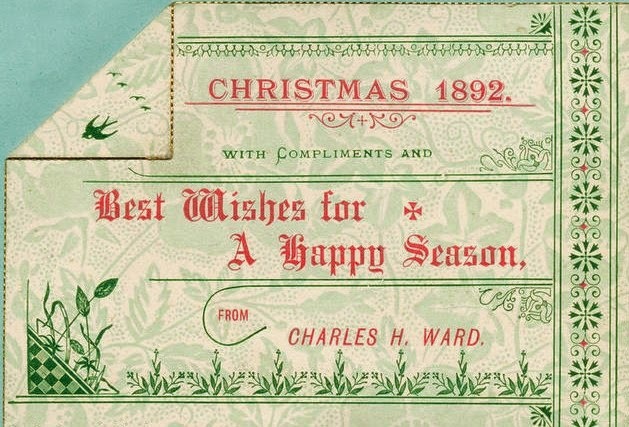 Ward later became the sole proprietor of the company. Those premises are now the Jamia Darussunah mosque(see photographs, below). 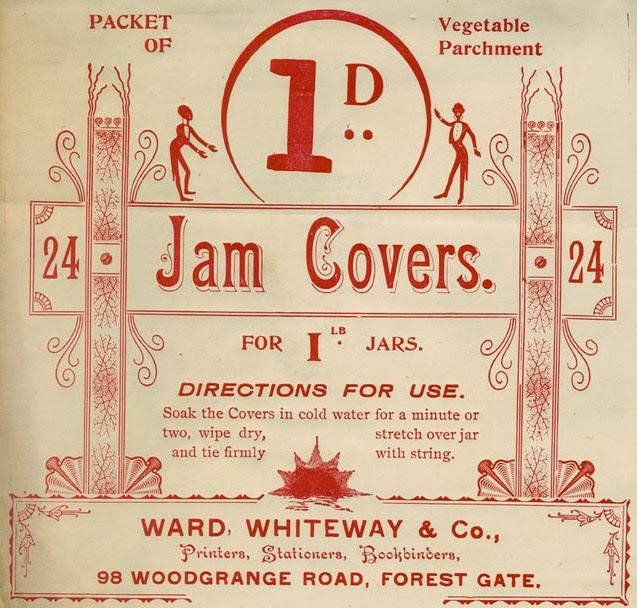 In addition to the jobbing printing work, as the letterhead indicates, the company produced a couple of local newspapers, the Forest Gate Gazette and West Ham Herald. They also had a branch office at 190 Fleet Street, which presumably was used for copy gathering from agencies. Unfortunately, the only publicly available copies of these publications is in the National Library of Australia! 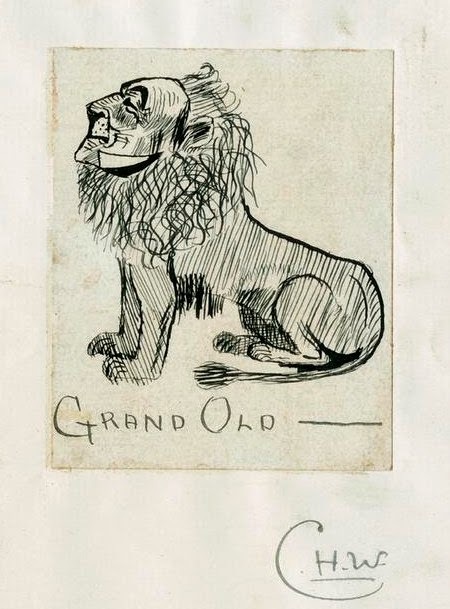 What follows is a selection of some of Ward's artwork held in Newham archives - to whom thanks are given for being able to access the material. 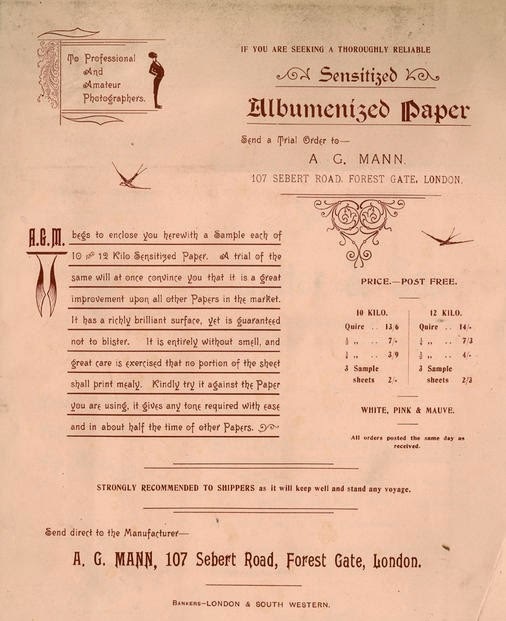 Much of it consisted of what would normally be mundane work for a local jobbing printer - business cards and stationery, letterheads, invitation cards, adverts etc for local traders - but incorporated unusually high design standards of design for such a press. 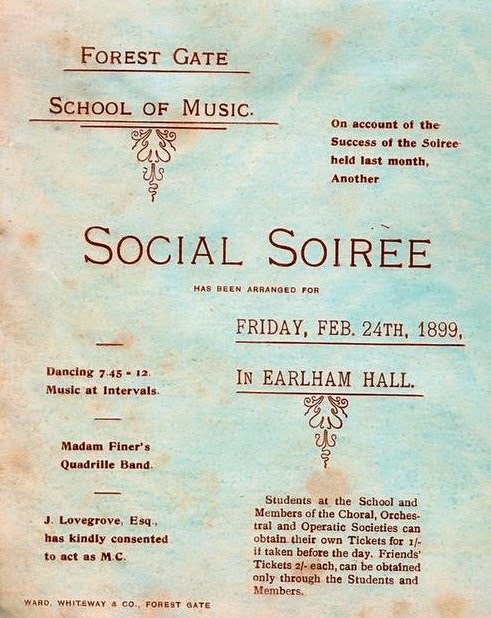 He also did some high quality programme-type work for local entertainment venues, including the Forest Gate School of Music in Earlham Grove (see here for full details of this innovative organisation). the activities of a Raper and Lothier! 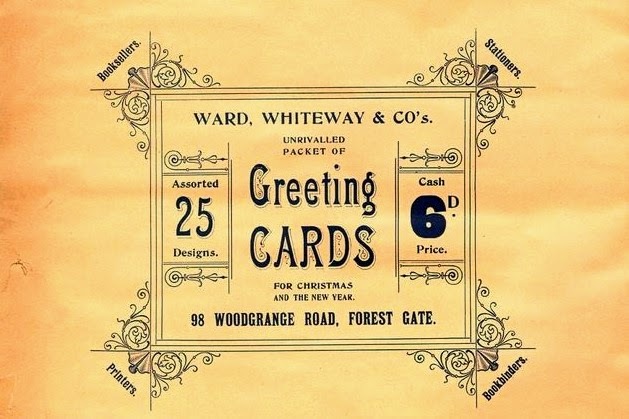 The innovative company not only produced materials for others, but was an early developer of greetings cards, which it published under its own imprint. some years before Marshall McLuhan! Assorted Christmas cards - 6 a penny! The materials, unfortunately, are undated, so it is difficult to track the progress of his artistic development. By 1911 he had moved, with his family, to 26 Clova Road - one of the more salubrious roads in Forest Gate (see photo of the house, today - below), and the company was transformed into a limited company, the Woodgrange Press, in 1913. It is unclear when it moved a little further up Woodgrange Road to the rather splendid Art Deco building, next to Wanstead Park station - but presumably in the 1930's. The company continued trading there until 1991, when it was dissolved. The lovely building (see below) was knocked down in 2008 to make way for Raymond Chadburn House, which clumsily attempts to incorporate elements of the former Eagle and Child pub into a block of flats. 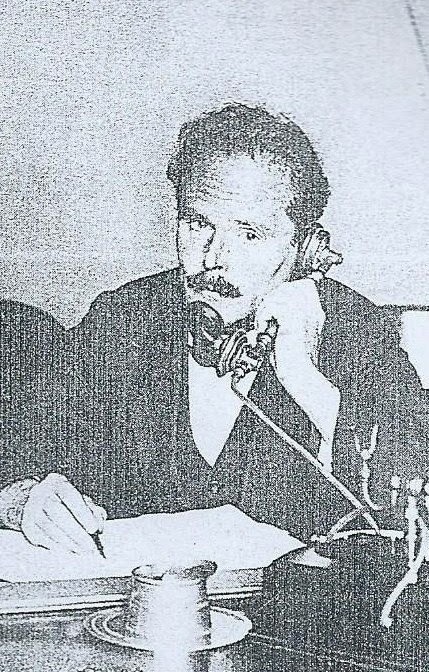 probably in 1930s. Demolished in 2002. Thanks to Carol Price, for the photo. 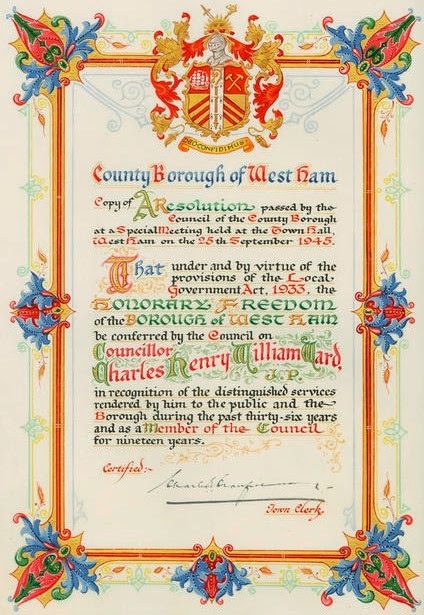 We do not know what kind of World War 1 Charles Ward had, but he turned to local politics at the onset of peace and was elected, briefly, as a West Ham Councillor in 1919. He was re-elected in 1925, for at least a further 20 years. He was a member of the Municipal Alliance, the name under which Conservatives stood in local elections in West Ham, at the time - perhaps not surprising for a small businessman seeking election to an overwhelmingly Labour local authority in East London. One of the issues that seriously divided the Labour Party and Municipal Alliance on the local council was their attitude to poor relief (over which local authorities had a large say). The early 1920s saw a great deal of local distress and unemployment in East London, which councils were charged with addressing. This put huge pressure on their budgets, because the rates' yield was low and the demand for poor relief high. There was a requirement on councils, from the central government, to 'balance the books' a near -impossible task, without punishing the poor, by reducing council staff wages and cutting the dole to local unemployed people. Some councils, most notably Poplar, under George Lansbury, fiercely resisted these demands, and were indeed jailed for their civil disobedience in doing so. There were pressures to resist in a similar fashion in adjacent West Ham. In 1921, for example, the Minister of Health, Sir William Joynson-Hicks said, while struggling with the Poplar Council rebellion that: "Poplarism is an infectious disease. The infection is already obvious in London Unions, such as Bermondsey and West Ham". 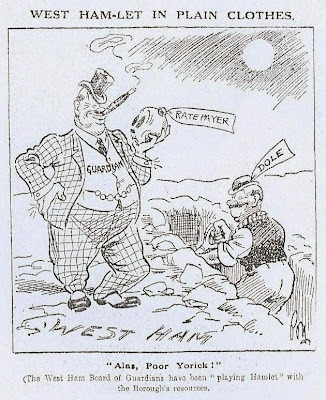 The Municipal Alliance, representing the interest of business ratepayers and the more prosperous of West Ham was fiercely opposed to the kind of civil disobedience being undertaken by Poplar Council, and by implication and spread of it to West Ham. 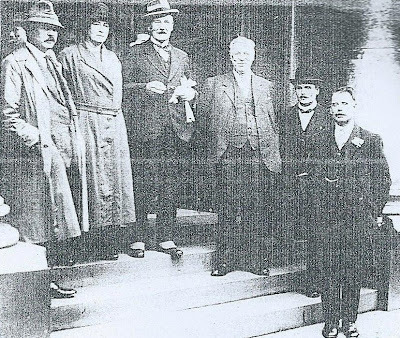 Charles Ward was very explicit in this opposition, when in an election meeting in 1922 he said "The Municipal Alliance does not believe in doles, and if the candidates were returned, they would do their best to stop this out-going of public funds". Reactionary attitudes like this almost sounded the death knoll for the Alliance in West Ham, and Labour almost obliterated it at the election (Labour 18 seats, Municipal Alliance 6). 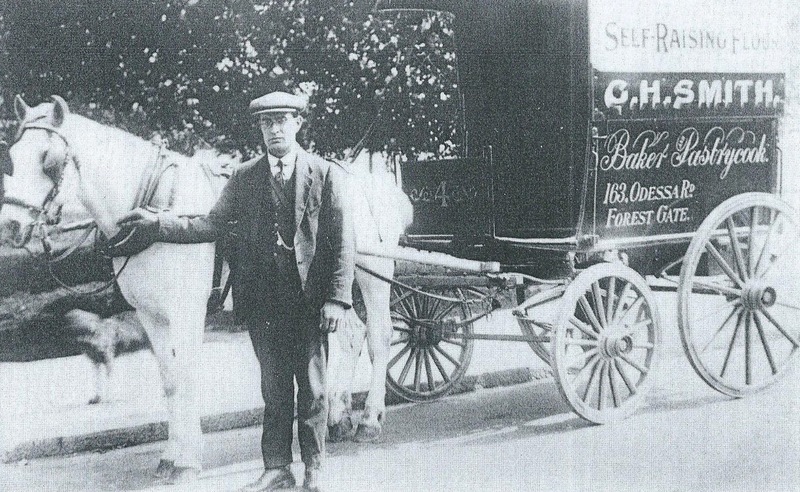 Ward, however, survived, representing the Forest Gate ward, the most prosperous in borough, for many years. 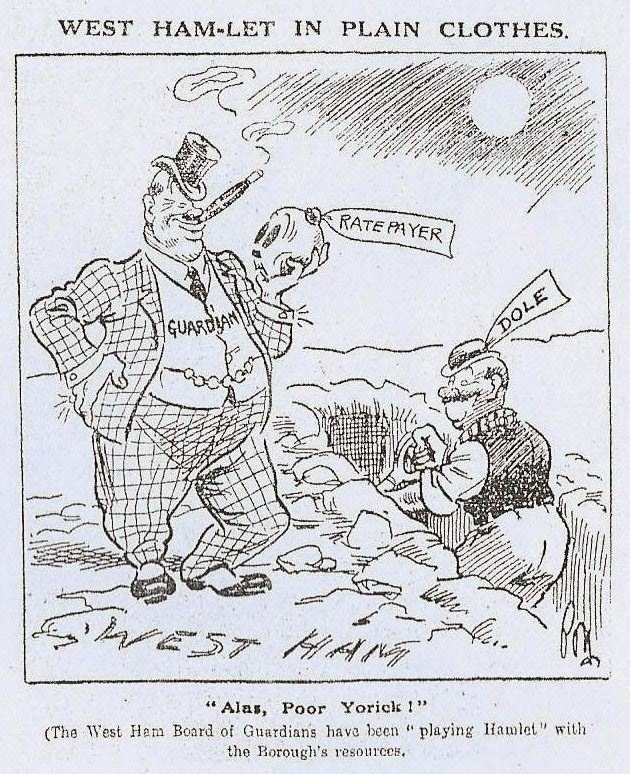 In 1925 West Ham councillors and Poor Law Guardians were summoned to the Ministry of Health, to account for the £1.8m deficit they had run up on the borough's poor relief account. Ward was a member of the delegation that met the then Minister of Health, Neville Chamberlain. It is unclear what his role, or contribution at the meeting, was as he was opposed to the existence of the deficit - as shown in the quote from his 1922 speech, above. One consequence of the meeting was, however, that the Board of Guardians was removed from office by Chamberlain, the following year, for having defied his edict to move towards the elimination of the deficit. We will return to this affair in a later post. Charles Ward, despite his contrary opinion, remained on the Council at least until 1945, when he was granted Freedom of the Borough, "in recognition of his distinguished local public service". We have almost no further details of Ward and his work, unfortunately. 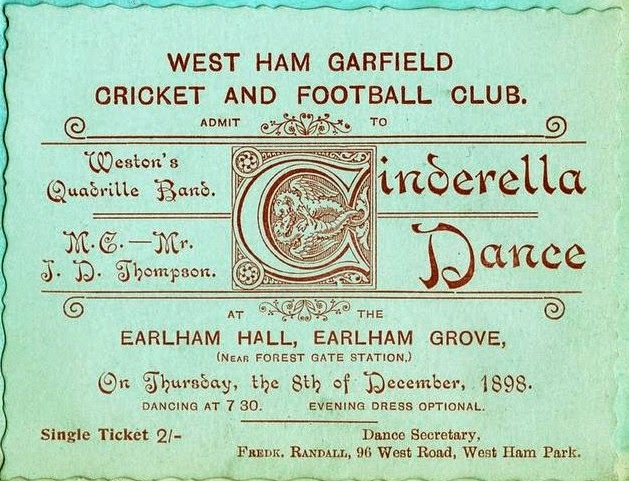 We do know, however, that he published a book on West Ham around the year 1923, of which we have been unable to obtain a copy from any library, or on-line source. According to an oral history interview, long-time Newham councillor Arthur Edwards gave to Eastside Community Heritage a decade or so ago, this book was regarded for many a year as the definitive book on the area, being "historically and socially accurate". 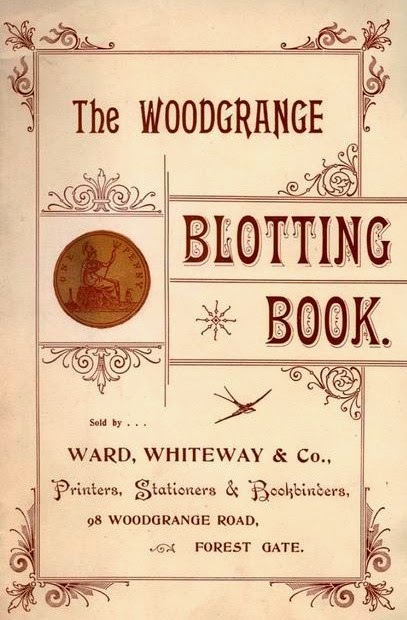 We would love to hear from anyone who may have access to Ward's book or any more details of the life of the fascinating local character and gifted graphic artist. From time to time we come across images or additional material that adds significantly to earlier posts. This article is a collection of some of those items. We have added the relevant sections as postscripts to the original article, for ease of access for future visitors, and added, at the end of each section, the hyperlink to the location of the original article, with its post script. We know that this site can only be a first draft of bigger stories for each of the short articles we produce, and are always keen to hear of more information about the subjects covered. Please feel free to add memories to the comments section of any blog, or send in details of further information, that we will be happy to acknowledge and display, in future update round-ups. We have recently come across a copy of the Illustrated London News of 11 January 1890. 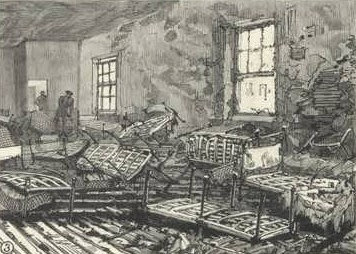 This included sketches of the fire at the Forest Gate Industrial School, on the previous New Year's Eve. We reproduce these, below, which should be viewed in conjunction with our article on the fire, in May of this year. The original story, with the sketches added as postscripts, can be accessed here. 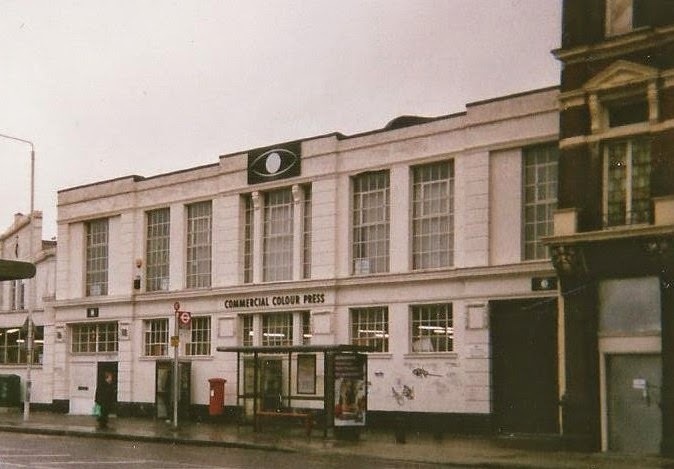 A Cinema Miscellany no 24 (2003) by Brian Hornsey has provided valuable additional local material about a few of the local cinemas covered in our history of them in our Every Picturehouse tells a story feature, of July 2013. We thank him for his painstaking research. The Imperial Palace (also known as the Regal and Rio) was for a while, around the outbreak of World War 1 known as the Forest Gate Electrical Theatre ( shortened to The Electric). 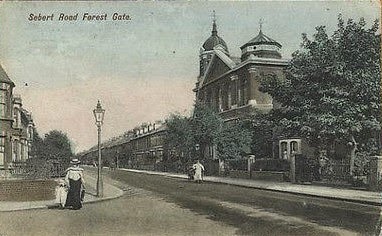 The Forest Gate Public Hall etc. 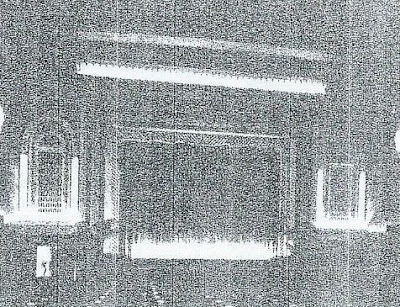 In its early days had 1,000 seats, but following refurbishment around the outbreak of World War 1 they were reduced to 750 - suggesting that the earlier seating was on benches, replaced by single seats after the refit. Prices for show around the start of World war were from 5d to 1/3d (depending on sitting within the cinema). The Queen's. Millionaire A E Abrahams had had such success with his Manor Park Coronation Cinema (built, nor surprisingly in 1902) that he built this - a sister cinema to it, near his Forest Gate home. Following its 1928 refit it became one of the first cinemas in the area to show talkies (introduced that year) and full length feature films. The Odeon. It was opened on 1 March 1937 with "Thank Evans", when prices ranged from 6d to 1/-, with continuous showings from 12.30pm, daily. 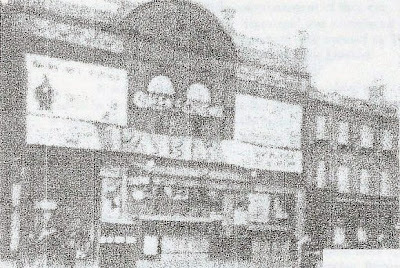 After the emergence of Odeon the two main cinemas in Forest Gate were it and the Queen's - operated by two of the country's major cinema chains. From this time, these two cinemas tended to show the major recent releases and the other local cinemas were left showing re-runs and 'B' movie feature films. World War 11 and local cinemas. 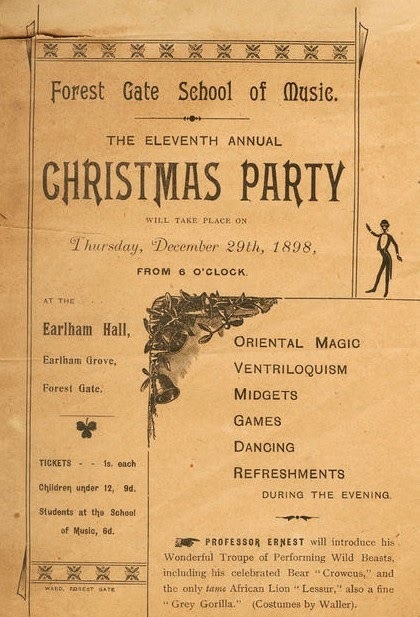 All places of entertainment - in Forest Gate, and nationwide - were closed on 3 September and all but essential staff were laid off (without compensation). When it became clear that the threatened invasion was not about to happen, cinemas reopened gradually, after about two weeks. There were four local cinemas operating by October 1939: The Odeon (1,800 seats), The Queen's (1,700 seats), The King's (600 seats) and the Splendid (550 seats). The Kings closed first, in 1940 (the circumstances are not clear). The Splendid, dropped its curtain for the final time, around then. 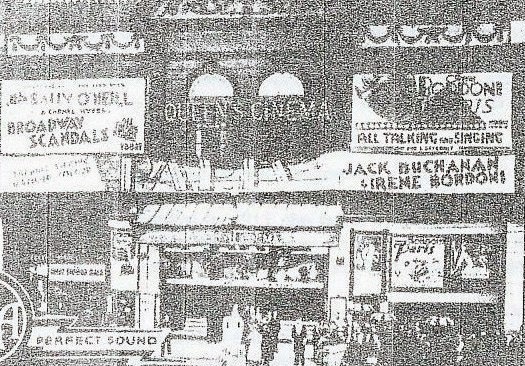 The Queen's was badly bombed on 21 April 1941, and its near neighbour the Odeon less severely hit. The Odeon was repaired, but the Queen's was now gone for good. So, by the end of the war the Odeon was the sole surviving local cinema, brining to an end a frantic half century of openings, closures, name changes and mergers locally. The Odeon was fully restored and operating at its peak level by 1950. It was fitted with a Cinemascope screen in 1954. Original article, with these notes and photos added as a post script, can be accessed here. The post has been viewed by a large number of both body builders and Arnie fans, as far as we have been aware. Not all of them will pass the sorry state that is the building, eighteen months after the fire. The building has been squatted and vandalised, but has more recently been boarded up and secured. Quite how effective this will prove to be, without a roof (! ), remains to be seen. The original article, with these photos as a postscript i can be accessed here. As visitors to this site may feel, we have an almost unhealthy obsession with this club, which ran for a single year in 1966/7 on Woodgrange Road. We have recently come across a couple of gems that can be added to our regular coverage. 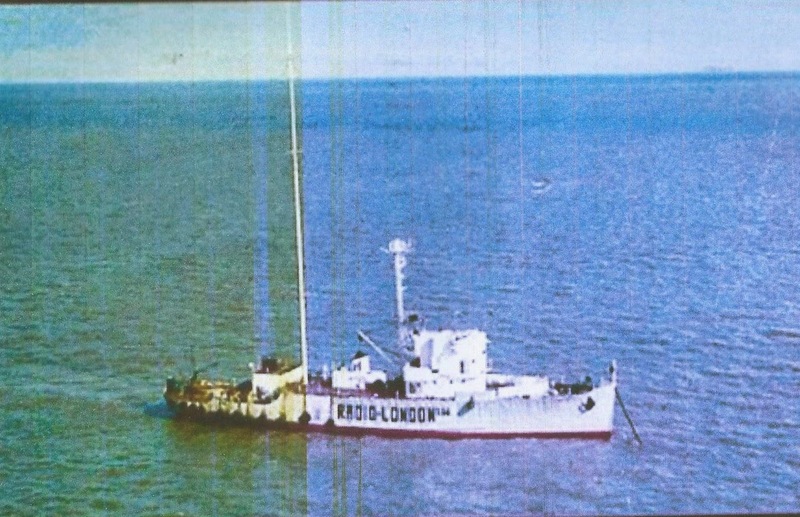 Paul Osborn, who has an interest in the former pirate radio stations, of the 1960's, contacted us with a fascinating MP3 recording, attached, below. The Club used to host regular sessions of the Giggle, Goggle, Guggle Club - essentially a disco held on Sunday afternoons, hosted by DJs from the pirate radio stations. Tony Blackburn and Ed Stewart, among others appeared. The You Tube clip, below, is from an advert broadcast on Radio London ("Big L") on 12 August 1967. It was promoting an appearance at the Upper Cut Club, by DJ Mike Quinn, who could be seen for "Half a crown"! 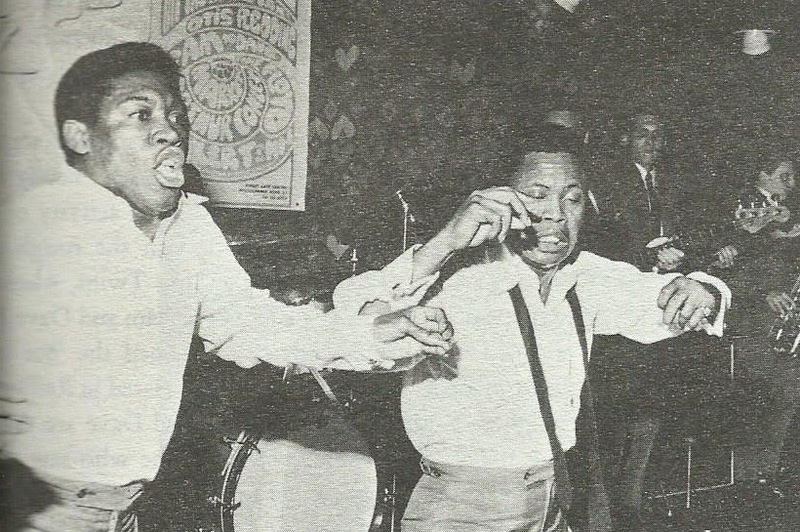 Upper Cut Club, on Saturday 12 August 1967. We have placed this as a postscript to the article on The Summer of Love, we published in August this year. It can be viewed here. Prominent Rock music journalist, Peter Guralnick produced a book, published by Penguin, Sweet Soul Music in 1986. It includes photos of both Sam and Dave and Otis Redding, appearing at the Upper Cut on 18 March 1967. Close inspection of the photos shows posters on the wall of the club, adverting the event. Guralnick credits Fred Lewis for the use of these photos. We have been unable to track Mr Lewis down, but would like to thank him, for our ability to use them. Any other, similar photos, would be very gratefully received! 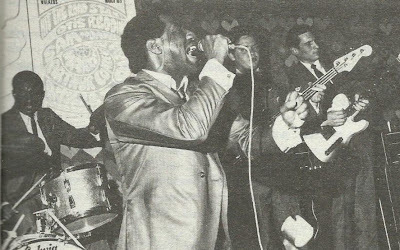 We have placed these photos on our article on the Stax Tour, of April this year, which can be accessed here.